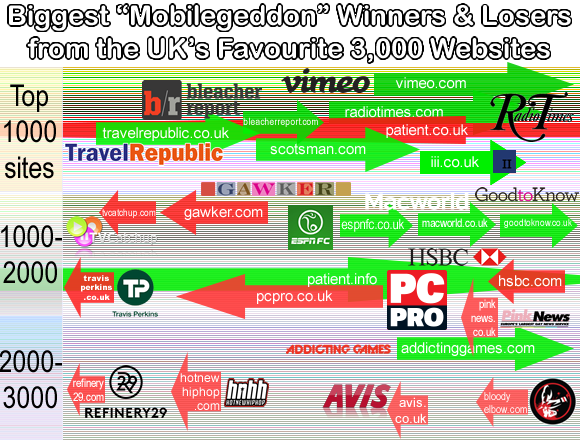 50 days on from “Mobilegeddon”; has Google impacted your web traffic? After Google’s latest search algorithm release that threatened to punish non-mobile-friendly websites’ search rankings began roll out on April 21st, how are websites’ Google ranking affected? Websites whose search ranking changed the most since latest Google algorithm change4. Arrow length proportional to gain/loss. Influential Software optimises the mobile-friendliness of clients’ websites’. To find out how we can do this for you, please get in touch. 3. [UK] Mobile overtakes desktop traffic, 09.06.2015, ecommerce week. See also Mobile Marketing Statistics 2015, 15.01.15, Smart Insights (based on data from comScore, with some good infographics). According to comScore (Mobile commerce growth ‘on fire’ , www.comscore.com 16.03.15) 60% of online sales in Q4-2014 in US came from mobile according to comScore. For the US, mobile overtook PC in early 2014 according to Mobile Now Exceeds PC: The Biggest Shift Since the Internet Began, Search Engine Watch. 4. Data from Sourcemetrics (change over from 21.06.15 to 11.06.15). UK site popularity ranking found with Alexa.